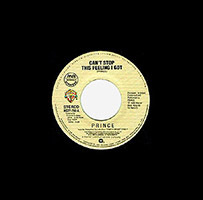 Can't Stop This Feeling I Got was the fifth single (third single by Prince, following Melody Cool by Mavis Staples) to be released from Prince's twelfth album Graffiti Bridge. It was released a few months after the album, but received a release only in the Philippines. It is not known if a wider release was planned. Both sides contain the album version of Can't Stop This Feeling I Got. Chart information for the Philippines is needed. This record wasn't issued on 12" format. This record wasn't issued on CD format. This record wasn't issued on Cassette or Digital format. This is the only Prince-related single to have been released only in the Philippines. This page was last modified on 24 November 2017, at 14:01.